As mentioned in my previous 100 Day Spending Ban weekly update, I placed an order on iHerb.com when there was a 20% off Real Techniques brushes. Main reason was to get my cousin a set of Travel Essentials, but I went a little - just a little - over-board and ordered a little more. Note: use code JBF362 to get $5 to $10 off your first order off iHerb.com! Mane 'n Tail, Herbal Gro Shampoo, 12 fl oz (355 ml) $4.11 - I am enjoying the de-tangling spray I got in my last iHerb order, therefore decided to try out the shampoo. Mane 'n Tail is very expensive in local stores so I am glad I can get these from iHerb! Avalon Organics, Biotin B-Complex Therapy Thickening Shampoo, 14 fl oz (414 ml) $7.29 - My friend Hakme has raved about the Avalon Organics line on her blog (hair care/shower), and because I'm staying away from local pharmacies (I'm prone to buying skin care 'accidentally'), I decided to order a shampoo to try out. Mineral Fusion, Volumizing Conditioner, 1.5 fl oz (44 ml) $2.72 - The Mineral Fusion line is on sale so I decided to give these two a go. Perfect size for a short holiday. I'm vulnerable to anything volumizing, grow, or thickening when it comes to tresses, can't you tell? Naked, 100% Coconut Water, 11.2 fl oz (330 ml) $1.93 - Both of these are from Brazil green coconuts. I have never tried these before. Now that I have, I am not impressed. Our Asian coconuts are way more delicious, sweeter, better taste and 'smoother'. I bet this is a healthy way to quench thirst, well, not going to repurchase; we have better coconuts at this part of the world! Stash Tea Company, Premium, Herbal Tea Sampler, Caffeine Free, 9 Flavors, 18 Tea Bags, 1.0 oz (30 g) $2.37 - Tried a couple of flavours, the mint is really strong and uplifting, the passionfruit is fruity and adds a splash of good mood to a dull day. A great way to taste several flavours in 1 box before committing to larger quantity! Triple Leaf Tea, Blood Pressure, Caffeine-Free, 20 Tea Bags, 1.4 oz (40 g) $4.30 - For Mr. A.
freebie - St. Dalfour Organic Spring Mint Green Tea - this taste fresh and nice, may repurchase! 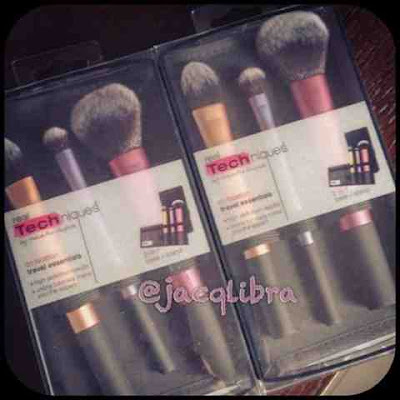 Go get yourself some Real Techniques brushes now! I'm sure I will make an order very soon, for the new set of 3 dual-fibre brushes. For first-timer at iHerb.com, use code JBF 362 for $5 - $10 off your order. That is almost free shipping if you choose the cheapest option! With that discount I bought three brushes set! Yay Eugenia! They are really nice brushes - tell me what's your favourite after you tried! I should try the real technique brushes. I'm pretty sure our 椰青taste a lot better than their coconut water.